Before we left for the trip, Mae's speech therapist gave me a PECS (Picture Exchange Communication) board to practice using with her while we were away. She'd had me email her pictures of some of Maggie's favorite toys before her last session, so there was a few lines with pictures of her own toys, along with things she might need to do like use the potty or wash her hands or play on the playground. Right now there are only two and a half pages of little laminated pictures with Velcro on the back, but I can already see that I'm definitely going to make more when we get back to Michigan and I have my laminator and crafting supply of Velcro. She loves using it . The pictures are already looking old and beat up because she is constantly playing with them. She knows exactly where each picture goes and if I take one out of order she quickly puts them back in the "proper" place. The first full day here in California she was quick to show me that I'd made a mistake when I packed her little back pack full of toys. 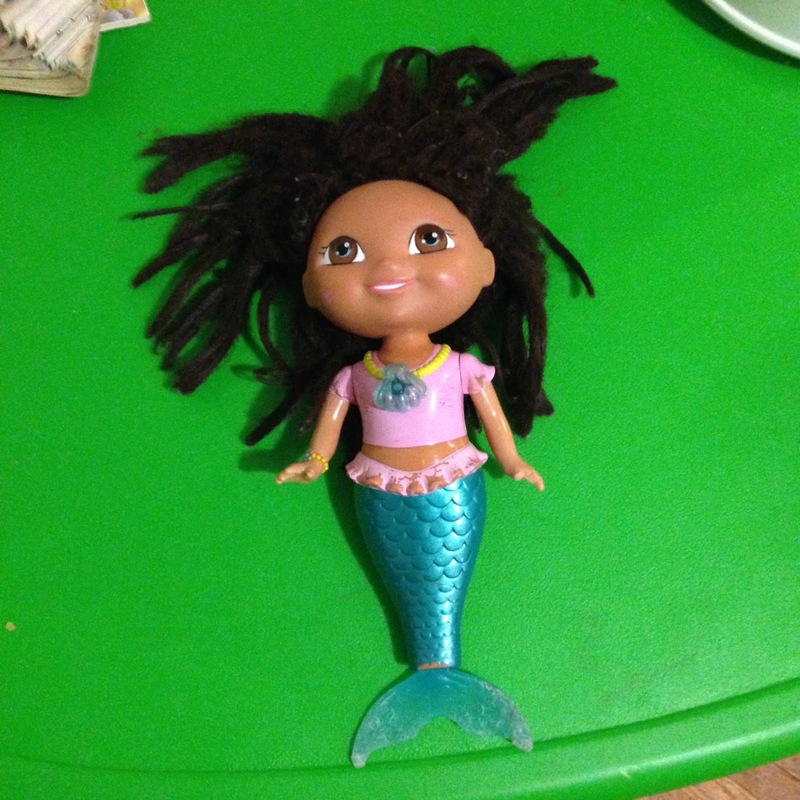 I'd filled her bag with mermaids and ballerinas, but she has so many mermaids that I couldn't bring them all and a well loved Dora mermaid was left behind. I didn't think it was a big deal, but apparently it was. Every time we open the book she points to a particular pair of pink shoes and the Dora mermaid. They are two (out of three) things in the book that I didn't bring (apparently it was okay that I left roller skating Boots at home). And not only is she showing me the pictures, she says the word when she shows me each card. Seeing both the word and the picture definitely seem to be helping her find the words to say out loud. In other news this morning when I brought Patch and James downstairs this morning I noticed that Maggie was wearing his flashing Cars sandals. When Grumpa came downstairs he noticed the same thing. And the following conversation had me smiling from ear to ear. Grumpa: "What's that on your feet Maggie? Who's shoes are those?" Grumpa: "Are you trying to play a trick on someone?" Saying yes is a big deal since saying yes and no to questions is something that she's been working on in therapy for the last few months and I think this is the first time she's said the word spontaneously in a conversation! Would you like help to make your own PECS book? I re-did Daniel's last summer. Packing tape also works as a laminator in a pinch. Wow! Hooray for Mae.... yes!! That is so exciting! We went through two years or so, where yes or no questions were the only things we could get a reliable answer for from my son. In a pinch; you can buy self laminating cards at places like Staples and Walmart. I used these to protect some old kids playing cards but I don't see why you couldn't use them to laminate a PECS printable card.